Ok I have to state for the record that these are only my experiments at dyeing yarn. I'm no dyeing expert. In fact, this is the first time I've dyed yarn of any kind and I started with silk because I carry undyed duke silk in my store. This has some nice tips for dyeing silk and precautions to take before dyeing. But I'm not going into too many details there. I just covered the work surface with lots of newspapers and used a mask to make sure I didn't inhale the dye. Food color that I bought from a nearby store. Picture below. Soak: I soaked the yarn overnight in room temperature water. This is necessary for silk as it does not soak quickly. Mix Dyes: The next day I mixed the dye stock. I wanted a gradation of the same color. So I mixed the same dye with three different dilutions. In 3 separate cups I mixed 1/8 teaspoon, 1/4 teaspoon and 1/2 teaspoon of dye powder in tepid water to make a paste. Then added some boiling water to dissolve the paste and added tepid water to make around 1/2 a cup of each mixture. While the dye stock cooled, I prepared the yarn for dyeing. 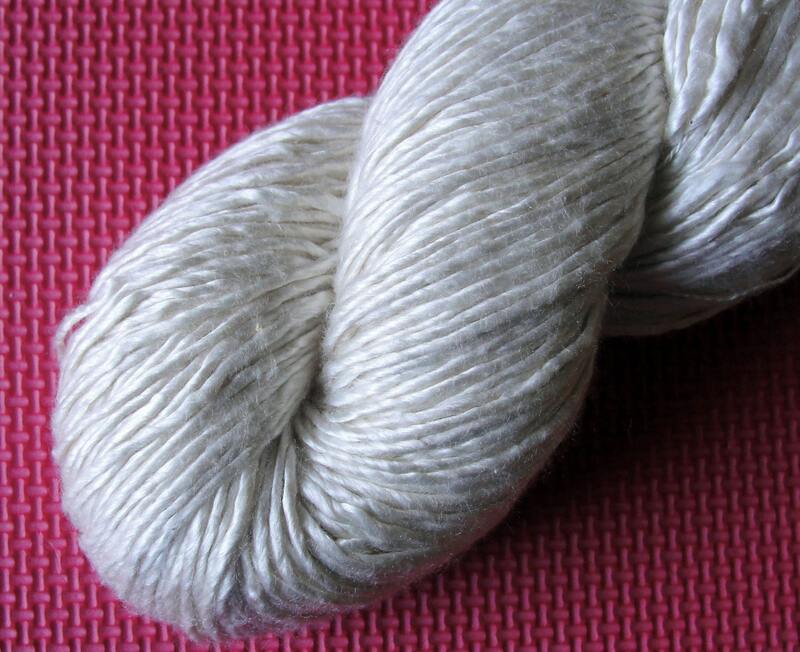 Wash yarn: I added a few drops of gentle dish detergent to the soak and rinsed the yarn in it. This is to take off any sericin (a gum secreted by silk worms) left behind. And rinsed the yarn off again in clean water. Vinegar Soak: Prepare vinegar soak by mixing 1 part white vinegar to 3 parts water. Soak the washed and rinsed yarn in the vinegar soak for only 10 mins. Very important for silk so as to not ruin the lustre. After 10 mns, squeeze water out gently and then place in a colander or screen till damp to the touch. Hand paint: Arrange the yarn in a bowl and get ready to dye. Pour the lightest dyestock on one section of the yarn and work the color in with your fingers. Make sure you've worked all the way through the yarn. Add the medium dyestock to an adjacent section a few inches away and work it in with your finger so the colors in the two sections mix gradually. Then add the third dilution and work the same way. Heat: I heated this in a covered bowl in a microwave in 3 short periods of 15s (because I had very little fibre 5gms) and then allowed to rest for 15s each time. Then after the bowl cooled, I rinsed the fibre in water. But the color ran quite a bit. So quickly dipped in vinegar soak again and cooked for 1mn this time because I got bolder. Then another 45s. After the yarn cooled down I rinsed it a few times till the water ran clear. And there you have it my first hand painted duke silk yarn. Now I just got to figure out what I can make with 5gms of silk yarn :-). Woo hoo! What d'ya think? I love this. It reminds me of a soft sunset! I agree. I wish I'd dyed more of this to make something useful out of it. gorgeous Vinita! love the gradation! Thanks KnittingDancer! I'm pretty proud of it :-)! That is completely lovely! I want to try dying silk now! It's quite fun actually. I'd been wanting to do this for a long time before I got down to doing it. And I realized, it doesn't need a lot of time actually.